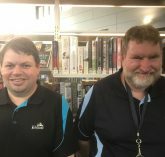 A well-known Bridgetown volunteer and community member who lives with Down Syndrome, has accepted an offer of employment with the Bridgetown Community Resource Centre resulting from an opportunity provided through Forrest Personnel’s 2018 WorkABILITY Day. Tenille is a well-known, bubbly character in Bridgetown. If you head to the gym, op shops, any café, and lawn bowls or just down the main street, chances are you would know Tenille. She will stop for a chat or yell out from across the road to say “Hi!” For years she has volunteered her time throughout the Bridgetown community, proving that she can be a valued member of the workforce. 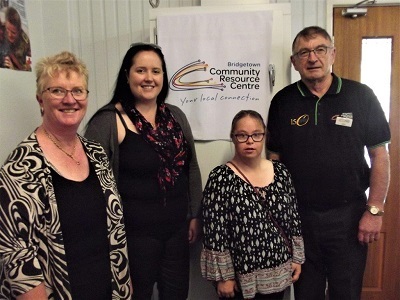 The Bridgetown Community Resource Centre (CRC)was happy to offer Tenille a work experience opportunity as part of Forrest Personnel’s WorkABILITY Day back in August. Working hard towards her goal of getting a job with assistance from Forrest Personnel and Cam Can, Tenille was offered a trial run as the cleaner at the centre in December. Not long after, Tenille was officially offered employment in this role. Forrest Personnel are proud of Tenille and look forward to her continued success. We also value and appreciate our collaboration with community organisations and employers such as Cam Can and The Bridgetown Community Resources Centre in supporting and providing life changing employment opportunities.